I’ve been getting these gmail spams for months now, with no predictable way to filter them out, since the spammers use variable email addresses, subject lines, and text content. 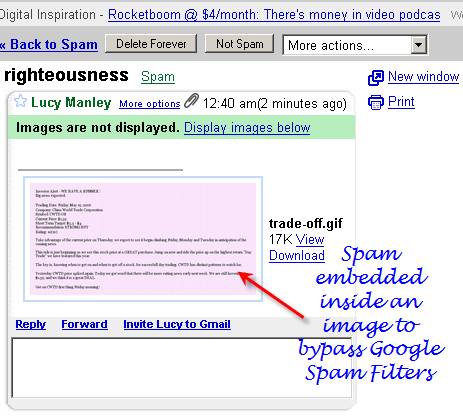 For Gmail to filter them completely, they’d have to scan every image for text and apply that to spam filters, which is probably too much processing required. Today I came up with a way to kill them forever, but it is definitely overdoing it, as it basically means no more .gif attachments in email from anyone anymore. But I don’t mind since I rarely get legit .gif attachments. Here’s what I did. – Hit the Create Filter button next to the search box at the top of Gmail. – For the Has attachment checkbox, check it. – In the field “Doesn’t have” put in text that their emails would contain somewhere. In my case, I just put in their domain names. Run a test search again, and make sure you don’t see any false positives. I just made this filter permanent and found out I had 13,000 of these in the past month. Thanks to spammers, email is getting more and more broken everyday, but at least there are ways to make it manageable. yet another update: this looks like a combo of how you’d put the hawk wings idea together with the one I presented, for Gmail. I’d strongly suggest going this route until spammers wise up and change their content types.